Sōjō Henjō (遍昭 or 遍照, 816 – February 12, 890) was a Japanese waka poet and Buddhist priest. His birth name was Yoshimine no Munesada (良岑宗貞). Thanks to a reference to him in the preface of Kokin Wakashū he is listed as one of the Six best Waka poets and one of the Thirty-six Poetry Immortals. Henjō was the eighth son of Dainagon Yoshimine no Yasuyo, a son of Emperor Kanmu who was relegated to civilian life. 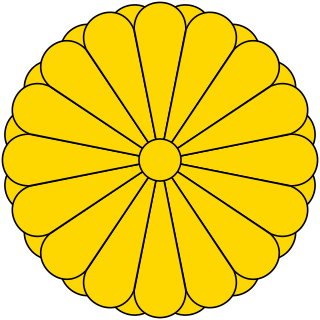 Henjō began his career as a courtier. He was appointed to the position of kurodo, a sort of Chamberlain of Emperor Ninmyō. In 849 he was raised to the Head of Kurodo (Kurōdonotō). 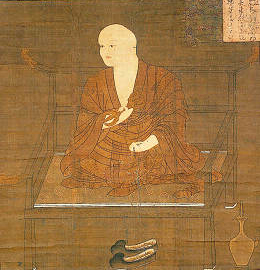 After Emperor Nimmyō died in 850, Henjō became a monk out of his grief. Dainagon (大納言) was a counselor of the first rank in the Imperial court of Japan. The role dates from the 7th century. Emperor Kammu was the 50th emperor of Japan, according to the traditional order of succession. Kammu reigned from 781 to 806. A chamberlain is a senior royal official in charge of managing a royal household. Historically, the chamberlain superintends the arrangement of domestic affairs and was often also charged with receiving and paying out money kept in the royal chamber. The position was usually honoured upon a high-ranking member of the nobility (nobleman) or the clergy, often a royal favourite. Roman emperors appointed this officer under the title of cubicularius. The papal chamberlain of the Pope enjoys very extensive powers, having the revenues of the papal household under his charge. As a sign of their dignity, they bore a key, which in the seventeenth century was often silvered, and actually fitted the door-locks of chamber rooms, since the eighteenth century it had turned into a merely symbolic, albeit splendid, rank-insignia of gilded bronze. In many countries there are ceremonial posts associated with the household of the sovereign. He was a priest of the Tendai school. In 877 he founded Gangyō-ji (元慶寺) in Yamashina, in the southeast part of Kyoto, but continued to be active in court politics. In 869 he was given another temple Urin-in or Unrin-in (雲林院) in the north of Kyoto and managed both temples. In 885 he was ranked in Sojo and called Kazan Sōjō (花山僧正). Tendai is a Mahayana Buddhist school established in Japan in the year 806 by a monk named Saicho also known as Dengyō Daishi. The Tendai school rose to prominence during the Heian Period of Japan, gradually eclipsing the powerful Hosso school and competing with the upcoming Shingon school to become the most influential at the Imperial court. However, political entanglements during the Genpei War led many disaffected monks to leave and in some cases to establish their own schools of Buddhism such as Jodo Shu, Nichiren Shu and Soto Zen. Destruction of the head temple Mount Hiei by warlord Oda Nobunaga further weakened Tendai's influence as well as the geographic shift of Japan's capital to Edo away from Kyoto. Gangyō-ji is a Buddhist temple in Kyoto, founded by the priest Henjō. The Emperor Kōkō endowed the temple and the emperor Kazan abdicated in this temple. He was rumored to have had a love affair with the great female poet Ono no Komachi. Ono no Komachi was a Japanese waka poet, one of the Rokkasen — the six best waka poets of the early Heian period. She was renowned for her unusual beauty, and Komachi is today a synonym for feminine beauty in Japan. She also counts among the Thirty-six Poetry Immortals. Ki no Tsurayuki was a Japanese author, poet and courtier of the Heian period. He is best known as the principal compiler of the Kokin Wakashū, also writing its Japanese Preface, and as a possible author of the Tosa Diary, although this was published anonymously. His son, Priest Sosei was also a waka poet and monk. Sosei was a Japanese waka poet and Buddhist priest. He is listed as one of the Thirty-six Poetry Immortals, and one of his poems was included in the famous anthology Hyakunin Isshu. His father Henjō was also a waka poet and monk. 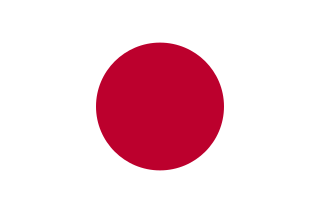 Emperor Go-Toba was the 82nd emperor of Japan, according to the traditional order of succession. His reign spanned the years from 1183 through 1198. Kūkai (空海), also known posthumously as Kōbō-Daishi, 774–835, was a Japanese Buddhist monk, civil servant, scholar, poet, and artist who founded the Esoteric Shingon or "mantra" school of Buddhism. Shingon followers usually refer to him by the honorific title of Odaishisama (お大師様) and the religious name of Henjō-Kongō (遍照金剛). The Kokin Wakashū, commonly abbreviated as Kokinshū (古今集), is an early anthology of the waka form of Japanese poetry, dating from the Heian period. It is an Imperial anthology, conceived of by Emperor Uda and published by order of his son Emperor Daigo, in about 905. Its finished form dates to c. 920, though according to several historical accounts the last poem was added to the collection in 914. The compilers of the anthology were four court poets, led by Ki no Tsurayuki and also including Ki no Tomonori, Ōshikōchi no Mitsune, and Mibu no Tadamine. Japanese poetry is poetry of or typical of Japan, or written, spoken, or chanted in the Japanese language, which includes Old Japanese, Early Middle Japanese, Late Middle Japanese, and Modern Japanese, and some poetry in Japan which was written in the Chinese language or ryūka from the Okinawa Islands: it is possible to make a more accurate distinction between Japanese poetry written in Japan or by Japanese people in other languages versus that written in the Japanese language by speaking of Japanese-language poetry. Much of the literary record of Japanese poetry begins when Japanese poets encountered Chinese poetry during the Tang dynasty. Under the influence of the Chinese poets of this era Japanese began to compose poetry in Chinese kanshi); and, as part of this tradition, poetry in Japan tended to be intimately associated with pictorial painting, partly because of the influence of Chinese arts, and the tradition of the use of ink and brush for both writing and drawing. It took several hundred years to digest the foreign impact and make it an integral part of Japanese culture and to merge this kanshi poetry into a Japanese language literary tradition, and then later to develop the diversity of unique poetic forms of native poetry, such as waka, haikai, and other more Japanese poetic specialties. For example, in the Tale of Genji both kanshi and waka are frequently mentioned. The history of Japanese poetry goes from an early semi-historical/mythological phase, through the early Old Japanese literature inclusions, just before the Nara period, the Nara period itself, the Heian period, the Kamakura period, and so on, up through the poetically important Edo period and modern times; however, the history of poetry often is different than socio-political history. The Shokukokin Wakashū is a Japanese imperial anthology of waka; it was finished in 1265 CE, six years after the Retired Emperor Go-Saga first ordered it in 1259. It was compiled by Fujiwara no Tameie with the aid of Fujiwara no Motoie, Fujiwara no Ieyoshi, Fujiwara no Yukiee, and Fujiwara no Mitsutoshi; like most Imperial anthologies, there is a Japanese and a Chinese Preface, but their authorship is obscure and essentially unknown. It consists of twenty volumes containing 1,925 poems. Kakuyū (覚猷) (1053–1140), also known as Toba Sōjō for his priesthood, was a Japanese artist-monk, and the son of Minamoto no Takakuni. 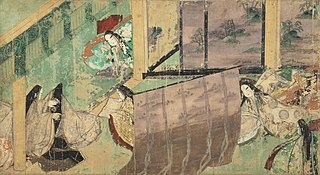 The Rokkasen are six Japanese poets of the mid-ninth century who were named by Ki no Tsurayuki in the kana and mana prefaces to the poetry anthology Kokin wakashū as notable poets of the generation before its compilers. Gyōson, also known as the Abbot of Byōdō-in, was a Japanese Tendai monk and waka poet of the late-Heian period. He became chief prelate of the Enryaku-ji temple in Kyoto, and one of his poems was included in the Ogura Hyakunin Isshu. Almost fifty of his poems were included in imperial anthologies, and he produced a private collection of poetry. The kana preface to the Kokin Wakashū is one of the two prefaces to the tenth-century Japanese waka anthology, the Kokin Wakashū. It was written by the poet/editor Ki no Tsurayuki. It is also known in English as the Japanese preface, distinguishing it from Ki no Yoshimochi's Chinese preface (mana-jo). It was the first serious work of poetic criticism on the waka style, and is regarded as the predecessor of later karon works. Ki no Yoshimochi was a Japanese poet of both waka and kanshi. He also composed the Chinese preface (mana-jo) to the tenth-century waka anthology, the Kokin Wakashū. He studied classics at the Imperial University, before serving various, mostly scholarly, positions at court. ↑ Richard Bowring The Religious Traditions of Japan 500-1600 2005 Page 164 "Henjō, being himself the grandson of Kanmu Tenno, was another frequenter of the court, famous as a waka poet; but much of his time from 876 onwards was devoted to the establishment of the Gangyō-ji 7c9! 'f[ clarification needed ] near the capital." ↑ Mikael S. Adolphson, Edward Kamens, Stacie Matsumoto Heian Japan: Centers and Peripheries 2007- p217 "not disassociate himself or his temple Gangyōji, founded in the 860s in the hills just east of Kyoto, from the court, but rather"; Page 218 "One of Kōkō's supporters was the aforementioned Tendai monk Henjō, who was given an opportunity to disrupt Fujiwara ... post (sōjō) within the Office of Monastic Affairs in 886 and allowed rare privileges and influence at the imperial court."